An international team of researchers, including leading scientists from the University of St Andrews, the Hawk Conservancy Trust and the University of York, say African vultures are likely to qualify as 'Critically Endangered' under the International Union for Conservation of Nature's global threat criteria. In a report published today (18 June 2015) in the scientific journal Conservation Letters, scientists from across Europe, Africa and North America have published the first continent-wide estimates of decline rates in African vultures: and find that many national parks and game reserves appear to offer vulture species in Africa little effective protection. 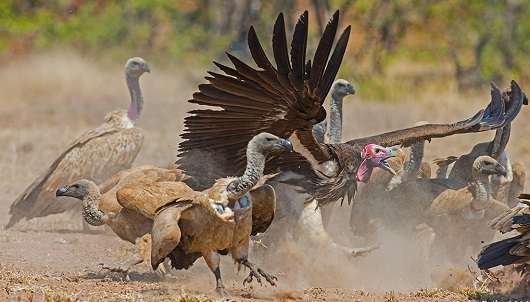 Scavengers such as vultures are essential to a healthy ecosystem; without them carcasses are largely consumed by mammalian scavengers such as dogs and jackals and this can increase levels of disease transmission, with possibly dire consequences for human health. Being long-lived, slow breeders, vultures take several years to reach maturity, and typically fledge only a single offspring every 1-2 years. Yet the study indicates that Africa's vultures are declining at rates of between 70% and 97% over three generations; a time interval used by the International Union for Conservation of Nature (IUCN) when assessing a species' threat status. Since six of the eight species are largely or wholly confined to Africa, and are projected to decline by at least 80% over three generations, the study suggests that they are likely to qualify as 'Critically Endangered' under the IUCN's global threat criteria. Dr Darcy Ogada of The Peregrine Fund and lead author of the study, said: "Large declines of Africa's vultures should ring alarm bells due to their immense ecological importance. Vultures are a vital component of a healthy environment, especially in Africa, where 'free' ecosystem services such as disposal of carcasses and other waste products remain the norm. If we don't take urgent steps to save these birds, and in particular to curtail wildlife poisoning, we should expect long-term consequences for the environment, as well as for humans in Africa. "What makes our results so concerning is that national parks and game reserves appear to offer these birds very little effective protection. Because vultures are so mobile and can easily travel hundreds or thousands of kilometres, decline rates were worryingly high even within protected areas." Continent-wide declines in vulture species have already been reported in four Asian vulture species. However the study's authors highlight two important distinctions between the Asian vulture crisis and that in Africa. First, to date, the rates of decline evident in Africa have been substantially lower than in Asia, affording African governments a window of opportunity in which to head off the environmental consequences of a collapse in this functionally important group. Second, while Asian vultures have declined largely as a result of a single factor (ingestion of the anti-inflammatory drug Diclofenac), African vultures face multiple threats. They include incidental and deliberate poisoning, the illegal trade in vulture body parts for traditional medicine, killing for bushmeat, mortality caused by power lines and wind turbines, and a reduction in habitat and the availability of food from wild game populations. The study suggests that the greatest quantifiable threat to Africa's vultures is poisoning, which accounted for 61% of all reported deaths. African vultures are often the unintended victims of poisoning incidents, in which carcasses are baited with highly toxic agricultural pesticides to kill livestock predators. However the study also shows that the recent rapid increase in elephant and rhino poaching throughout Africa has led to a surge in the number of vulture deaths recorded, as carcasses have been poisoned specifically to eliminate vultures, whose overhead circling might otherwise reveal the poachers' illicit activities. Dr Ogada added: "The situation requires the resolution of a number of environmental and cultural issues. We propose a range of measures, including more effective regulation of the import and sale of agricultural and other chemicals commonly used as poisons. This would benefit not just vultures, but all species widely targeted by pastoralists and poachers in Africa." Dr Phil Shaw of the University of St Andrews' School of Biology said: "Vultures are charismatic, iconic species, but they are also functionally important, playing a vital role in clearing up carcasses of wild animals and livestock, and incidentally helping to suppress disease transmission. Our study demonstrates that declines are occurring throughout Africa and – because vultures live long and breed slowly – the severity of these declines is greater than had been appreciated. It's rare for an entire functional group to come under threat, in this case with potentially major ecological impacts – as well as implications for human health." Dr Campbell Murn, Head of Conservation and Research at the Hawk Conservancy Trust, said: "Vultures are integral to Africa's ecological and cultural landscapes, and it is change in cultural practices at multiple levels that is required to reverse this disastrous situation. Without such changes, and the reversal of these declines, the full consequences of Africa's vultures disappearing cannot be predicted. "We operate research and conservation programmes for four vulture species at multiple sites in southern Africa, in both protected and non-protected areas. Four of the eight African vulture species assessed in the study can be seen at the Hawk Conservancy Trust, near Andover in Hampshire." Dr Colin Beale of the University of York's Department of Biology said: "At my field sites in Tanzania we have noted declines in vulture species over many years, but only when putting together the full continental picture did we realise how critically threatened these birds have become. Because these birds forage over such large areas, effortlessly crossing international borders, we're concerned that even the largest protected areas of the Serengeti and Ruaha ecosystems are inadequate to protect them for the future. " How can we help endangered vultures?